Discover one simple belly fat fighting Mediterranean dish that researchers say contributes to lowering high blood pressure while you are taking off those extra pounds. Researchers from the University of Barcelona report their findings from a large scale study designed to investigate whether eating a belly fat fighting Mediterranean vegetable-based Gazpacho soup known to be rich in phytochemicals, can actually lower blood pressure and/or reduce the prevalence of hypertension in individuals who are at a high risk of developing cardiovascular disease. According to a news release issued by the researchers, hypertension is a major public health problem that affects approximately 25% of the adult population. The danger of uncontrolled or untreated high blood pressure is the fact that it is the main risk factor for developing a myocardial or cerebral infarction, which are the leading causes of death in modern western populations. The study, currently In Press in the journal Nutrition, Metabolism and Cardiovascular Diseases titled “Gazpacho consumption is associated with lower blood pressure and reduced hypertension in a high cardiovascular risk cohort” reports the results of data analyzed from 3,995 participants identified as high risk for cardiovascular disease who ate Gazpacho soup on a daily basis throughout the study period. Gazpacho soup is just one of many old Mediterranean dishes that have previously been identified and popularly promoted as a healthful way to lose weight and achieve a healthier life in the fight against metabolic disease through a Mediterranean dieting lifestyle. One surprising finding of the study was that the relatively high salt content of traditional Gazpacho soup does not appear to adversely affect blood pressure. According to the study coordinator and co-author Rosa M. Lamuela, the Gazpacho soup sodium content factor was “…an unexpected one, as it contains salt, one of the restricted ingredients to maintain arterial pressure levels. Despite this, the results of the study describe that arterial pressure of gazpacho consumers is lower than the one of non-consumers. The reason may be that bioactive elements of gazpacho counteract the effect of salt ingestion,” she says. 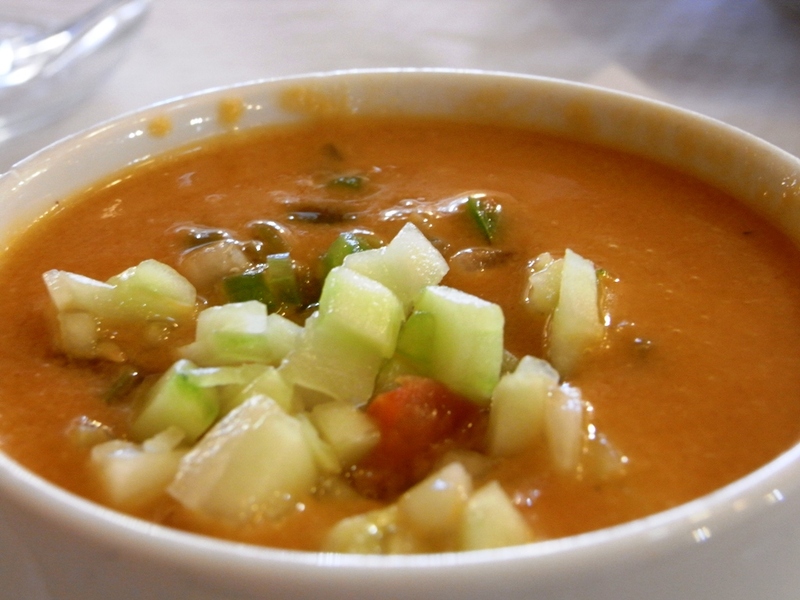 “Gazpacho highly contains carotenes, vitamin C and polyphenols. The final balance of the bioactive elements of gazpacho and its salt content makes it to be cardio-healthy; in other words, at the end, the positive effect of all the ingredients that contribute to the reduction of arterial pressure prevails over salt’s effect,” says Alexander Medina-Remón. Roughly chop the cucumbers, bell peppers, tomatoes, and red onions into 1-inch cubes. Put each vegetable separately into a food processor fitted with a steel blade and pulse until it is coarsely chopped. Do not over-process! After each vegetable is processed, combine them in a large bowl and add the garlic, tomato juice, vinegar, olive oil, salt, and pepper. Mix well and chill before serving. The longer gazpacho sits, the more the flavors develop. Reference: “Gazpacho consumption is associated with lower blood pressure and reduced hypertension in a high cardiovascular risk cohort. Cross-sectional study of the PREDIMED trial” Nutrition, Metabolism d Cardiovascular Diseases (Article In Press December 2012); A. Medina-Remón et al.